I have a new rule – all bars should be built on a rotating floor. Why you ask? Because it is just fabulous. 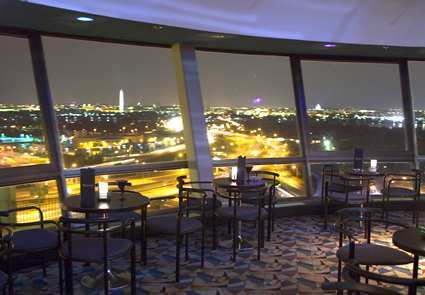 On a recent whirlwind trip to Arlington, VA while staying at the Doubletree I had the fortune of discovering the Skydome Lounge, which boasts as being the only revolving bar in the area, which is a pretty big claim. If you are only in town for a short time then it is the best way to see all the sites at once. From Skydome Lounge you can enjoy views of the Washington, D.C. skyline showcasing the Potomac River, Memorial Bridge, U.S. Capitol, Washington Monument and Lincoln Memorial. Nobody had informed us this was a rotating bar, which really should be a requirement. After jet lag and a long day I wasn’t really willing to question the fact that I was almost certain that we had taken a seat by the window, but were now seated by the bar. It was only when we realized that some of our belongings were no longer with us that we began to question anything. At that point some of the staff were kind enough to inform us that it was a revolving bar and that we had set our stuff down on a fixed location. As they say, “All’s well that ends well.” And now I have another fabulous hotel bar to add to my favorites! Hours: Sun.-Thur., 4:30 p.m.-12 a.m. and Fri.-Sat., 4:30 p.m.-2 a.m.
Are you sure it was the bar that was spinning? I was only sure once the employees at the bar confirmed it, but then again maybe they were trying to be nice. Sure wish I had known about this place when I was in the DC area in March!! Well done, Jenna! Thanks for stopping by and reading, Nadine! Next time you are D.C. definitely check this place out. I agree with your Instant Grativacation » You Spin Me Right Roundâ€¦.Skydome Lounge Edition, great post. I like Your Article about Instant Grativacation » You Spin Me Right Roundâ€¦.Skydome Lounge Edition Perfect just what I was searching for! . I like Your Article about Instant Grativacation » You Spin Me Right Roundâ€¦.Skydome Lounge Edition Perfect just what I was looking for! . Admiring the hard work you put into your website and detailed information you offer. It’s awesome to come across a blog every once in a while that isn’t the same unwanted rehashed material. Fantastic read! I’ve bookmarked your site and I’m including your RSS feeds to my Google account. I got what you specify, thanks for putting up. Woh I am pleased to conceive this website through google. Thanks For Share Instant Grativacation » You Spin Me Right Roundâ€¦.Skydome Lounge Edition.